The Resort has won similar distinctions previously in the Annual Caribbean Travel & Leisureâ€™s Readersâ€™ Choice Awards and was also named one of â€œ20 Awesome Beachfront Hotels Under $200â€ in the February 2012 issue of Caribbean Travel + Life magazine. 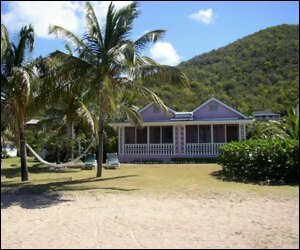 For years, Oualie Beach Resort has been promoting itself as Nevisâ€™ premiere affordable accommodations choice. A full-service boutique property that is family-owned and operated, it offers many amenities typical of larger hotels while maintaining friendly, individualized service and a sense of community that is within the means of most vacationers. Situated on a sandy beach on the picturesque island of Nevis, Oualie Beach Resort is a uniquely charming, family-owned, boutique hotel designed to appeal to travelers seeking a laid-back, personalized experience. The propertyâ€™s management is passionately eco-friendly and employs sustainable tourism practices including solar water heaters, low energy lighting, water saving techniques and community development initiatives. Oualieâ€™s 32 spacious, guest rooms and suites are nestled within authentic one or two story Caribbean cottages, each with outstanding views of the property, beach and Caribbean sea. Accommodations are well appointed and feature covered front porches complete with authentic planterâ€™s chairs, most with four poster mahogany beds and invitingly cushioned furniture. Wireless internet access is complimentary and available in-room, on the beach and throughout the property. When not exploring the island, guests can enjoy numerous activities on property, including snorkeling, sailing, kayaking, spa treatments, mountain biking, scuba diving, or simply relaxing in a hammock or lounge chair on the beach watching the pelicans dive or the monkeys playing in the fruit trees. Green and Hawksbill turtles nest regularly on the beach and guests can sign up to be alerted when turtle hatchings occur. The Federationâ€™s only 5-Star PADI dive operator, Scuba Safaris, is based on site at Oualie Beach Resort. Guests may dine in a casual open air ambiance at the Oualie Restaurant on tempting Caribbean fusion cuisine. The restaurant uses locally grown produce where ever possible and all fish and lobster are caught locally and kept fresh on ice, never frozen. Oualie Beach Resort rates for 2015 start at $179 per room based on double occupancy and packages are available to suit a variety of special interests ranging from family to scuba to weddings & honeymoons. For more information or reservations, call +1(869) 469-9735, or visit oualiebeach.com or follow the property on Facebook and/or Twitter for special deals.